The Fundamentals of AutoCAD Course Online for MAC is designed for the beginning AutoCAD user who wants how to use AutoCAD on the MAC platform. 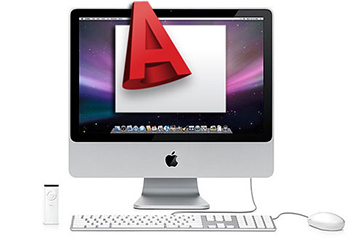 Taught 100% online, the AutoCAD for Mac course will cover most 2D AutoCAD Mac commands. Successful graduates of this course won't have any problem creating working drawings at the end using the MAC version of AutoCAD. As part of the course you can specialize in Mechanical, Architecture, or Electrical AutoCAD at no extra cost. Note: you must have access to AutoCAD 2017, 2018 or 2019 for the Mac. If you don't have access to the MAC version of AutoCAD you can request a Student Version. The following specialization courses are offered specifically for the MAC. Note if you completed a specialization during the AutoCAD for MAC course you should NOT register again. The specializations listed below are for people that did not complete a given specialization during the AutoCAD for MAC course. You can request an E-MAIL sent during course registration to remind you to register for the upcoming class. By following us on Facebook you can stay up to date on class enrollment and start dates. While there are no pre-requisites for the Fundamentals course, you should be familiar with basic computer operations. You should know how to use E-MAIL to send and receive files, feel comfortable using the internet, be familiar with basic file management procedures (creating a folder, opening and closing a file etc.). Basic computer operations are not covered in the course. Summer 2019 class begin May 15 end July 5. There are no set times when you have to be on-line. You can access the website 24X7 and submit assignments and tests at any time. You will need to spend an average of 10 hours a week on the class. How you manage your class hours is up to you. YOU set the schedule. You will receive feedback for EVERY assignment and test submitted within 24 hours. Upon successful completion of the course you will receive a certificate. The Fundamentals class covers the use of AutoCAD only and does not cover any basic drafting procedures or design theory. You can specialize in ONE of the following Architectural, Mechanical or Electrical AutoCAD at no extra cost. If you successfully complete a specialization you would receive a special certificate indicating such. To be advised of future course dates sign up for our mailing list. This includes the entire Fundamentals course as well as one of the optional mechanical, electrical, or architectural specialization's. The required textbook will be provided on-line in PDF format via the course website. Courses begin May 15 end July 5.